Rana Mack, owner of Sawtooth Restaurant and Lounge, said the Randolph spot is closed. WEST LOOP — After a recent shooting, a looming eviction and a legal battle with the city, Sawtooth Restaurant and Lounge on Randolph has closed, owners confirm. In an e-mailed statement to supporters, the owners of Sawtooth said the restaurant-lounge was "officially" closing it's doors. "Over the past six months, Sawtooth has continued to support, respect, initiate change to make a positive impact with rebranding ourselves," the statement read. "However, with the recent unfortunate violence at any similar restaurants/lounges/venues or 'urban' establishments, Sawtooth Restaurant & Lounge has closed our doors for good." Owner Rana Mack confirmed to DNAinfo Chicago last week that the Randolph Street spot would likely close. Previously owned by Dzuy Dao, who still holds the liquor license for the business, Mack took over Sawtooth in 2013. The closing comes after an early morning shooting March 28 near the club, 1350. W. Randolph St. A 29-year-old man was critically injured in the incident. Sawtooth was open earlier that evening for a private event but was not open at the time of the shooting, Mack said. In the last month, Sawtooth had only operated private events out of the space and was typically closed to the public, she said. The troubled restaurant and lounge was also facing an eviction and city attempts to revoke its liquor license, officials confirmed last week. 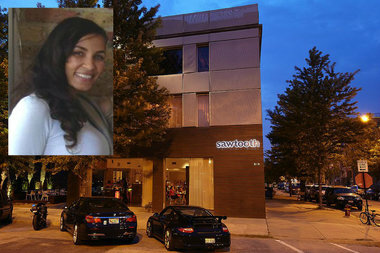 According to documents obtained by DNAinfo Chicago, the owner of the building is seeking to immediately evict Sawtooth. The move comes as the city's Legal Department is also working to take away the restaurant-lounge's liquor license, city officials said. In a pending license discipline case, the city alleged violations against owners of the club included subterfuge, illegal expansion and a illegally operating a restaurant as a tavern, said John Holden, spokesman for the city's Law Department. In January, the Randolph Fulton Market Association held a meeting to address concerns about crime in the 1300 block of West Randolph Street. On Monday, Romanelli said the neighborhood has "zero tolerance" for crime. In the last two years, two other shootings near Sawtooth have made headlines. Around 1:25 a.m. Dec. 28, someone shot a 35-year-old man walking in the 1300 block of West Randolph Street and two men opened fire, striking him in his left thigh, according to police. In March 2013, a 26-year-old man was shot in his leg in an early morning shooting outside Sawtooth. More than two dozen police cars responded to the shooting because of a fight that reportedly broke out about the same time. Earlier this month, two men died and another man was wounded in shootings after a fight in Dolphin nightclub in Bucktown spilled into the street. The violent episode prompted the city to bring a new case to court in an attempt to close the club. Two high-profile shootings near Funky Buddha Lounge in November prompted neighbors to call for the longtime River West bar to close. In February, Ald. Walter Burnett Jr. confirmed the bar had closed for good.